Middle Grade Monday and Mystery Monday merge at last, with this 3rd installment in the fantastic Wells and Wong series! Publication Info: RHCP Digital, 2015 (Kindle); Hardback 2015 by Corgi Children's, 336 pages. Daisy Wells and Hazel Wong are taking a holiday through Europe on the world-famous Orient Express. From the moment the girls step aboard, it's clear that each of their fellow first-class passengers has something to hide. Even more intriguing: rumour has it that there is a spy in their midst. Then, during dinner, there is a bloodcurdling scream from inside one of the cabins. When the door is broken down, a passenger is found murdered, her stunning ruby necklace gone. But the killer is nowhere to be seen - almost as if they had vanished into thin air. 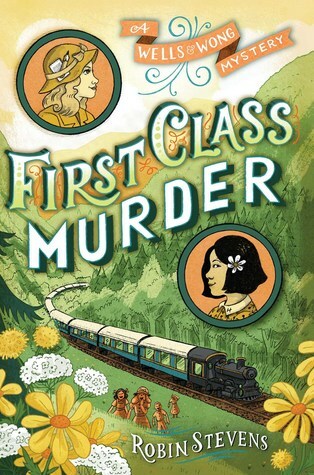 Daisy and Hazel are faced with their first ever locked-room mystery - and with competition from several other sleuths, who are just as determined to crack the case as they are. I've been delighted with this series from the start, and can't imagine why it took me so long to get back for book #3. This was a worthy addition to the series, with the relationship between Daisy and Hazel developing nicely (I'm happy to see Hazel gaining self-confidence and starting to hold her own more with Daisy). Other characters were fun and interesting, and I enjoyed seeing the girls work through their reluctance to work with any other sleuths (as well as their well-founded contempt for the adult in charge of the investigation). I continue to be amazed that Ms. Stevens can actually write murder mysteries for children, and makes it work. In many ways, it's not much different from cozy mysteries for any age--keep the focus on the mystery, not the murder, and use a touch of humor to avoid being weighed down by the corpse. One thing I realized with this was that, unlike with most cozy mysteries where I am unimpressed with the amateur sleuth's motives for sleuthing, with the girls no excuse is needed. They are kids, and having decided that they are detectives, they just don't need an excuse or permission to solve the crime. As they say, it's what they do. The mystery is well put together, too. I ran through much the same set of suspects they did, discarding each in turn mostly because the girls settled on him/her too early in the book for that to be the whole story. I did get part of the answer right--the killer isn't a big surprise--but it took the girls to figure out how it was done. That was a clever bit of plotting (and detecting). The book is also, of course, a tribute to Agatha Christie's Murder on the Orient Express, and I can't help wondering if there's a nod to Lord Peter Wimsey in there, too! These will mean more to adults than to most juvenile readers, but readers of all ages can appreciate that Stevens is also dealing with issues of race, racism, and belonging. This is a great series, for older children and for any lovers of cozy mysteries, and this is a good addition to the series. I do recommend reading in order--there are minor spoilers in this book for the preceding books. My only objection is that I'm pretty sure that vocabulary has been changed for the American edition. I really wish publishers wouldn't do that--let American kids learn that not everyone speaks exactly as they do! On the other hand, the author deals well with things that are both British and dated (the setting is the 1930s) by having Daisy provide a glossary at the end, so confused readers can look up unfamiliar words. Full Disclosure: I borrowed an electronic copy of First Class Murder from my library, and received nothing from the author or the publisher in exchange for my honest review. The opinions expressed are my own and those of no one else. I am disclosing this in accordance with the Federal Trade Commission's 16 CFR, Part 255: "Guides Concerning the Use of Endorsements and Testimonials in Advertising." Yes, it sounds hard to make a mystery with a murder in a middle grade novel. Glad the author made it work. I'll add this one to my TBR list. Thanks. She does a great job of it, and as I say, it's a good read for adult fans of the cosy mystery, too. You're the person who introduced these books to me!